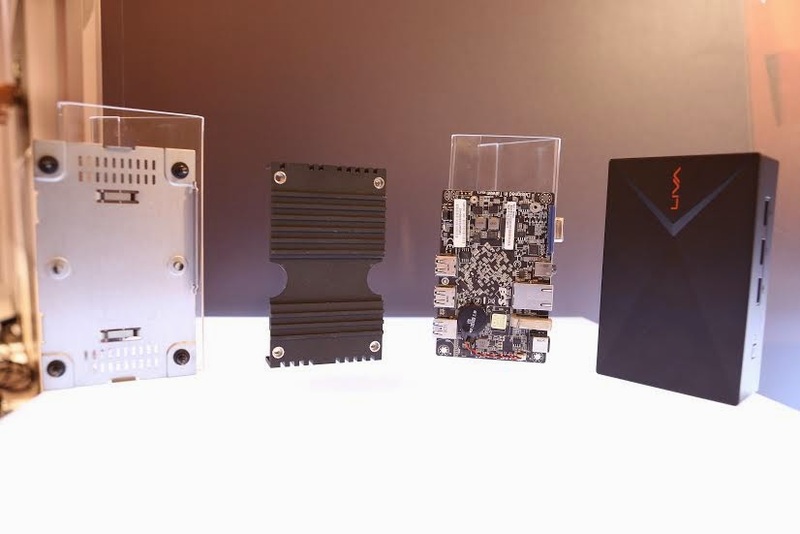 Small, Capable & Everywhere - Elitegroup Computer System (ECS) is proud to introduce the latest mini PC – LIVA X, a fan-less design, quiet and low power consumption small-size computer. Adopting Intel® Bay-Trail M SOC and 15W ultra-low power design; supporting Windows 8.1, Windows 7, Linux, and Ubuntu operating systems, as well. LIVA X supports USB 3.0 port, Wi-Fi & Bluetooth wireless connection technology. End users can upgrade storage capacity via mSATA SSD. Most importantly is the size of LIVA X ringing in at only half a liter! 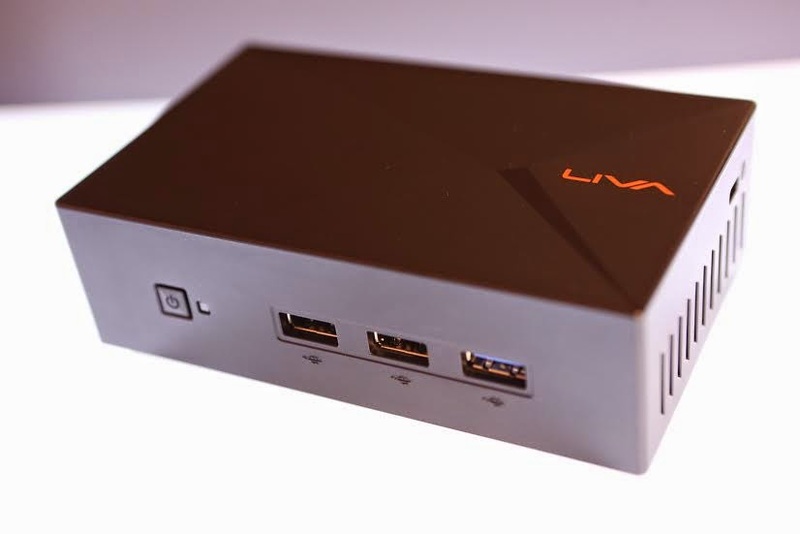 LIVA X Mini PC brings a whole new PC experience to the world. No noise thermal design - The LIVA X features a no noise thermal design, providing a real silent Mini-PC. Enjoy it without any noise. Thanks to Intel new Bay Trail-M SOC 22nm processor. 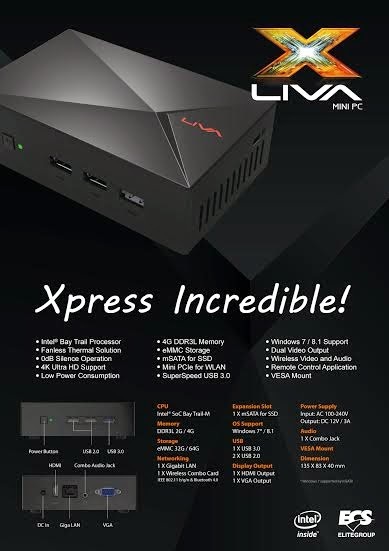 LIVA X features ultra-low power consumption, only 1/10 traditional desktop usage. LIVA fits everywhere - The power of a 64-bit Dual core 2.25 GHz machine with 4GB DDR3, 64 GB eMMC, WiFi, Bluetooth, USB 3.0 and mSATA. And it’s smaller than your mouse! Thanks to the native VESA mount, you can place the LIVA X practically anywhere - behind displays, monitors and TVs. This doesn’t only save space, but it’s also the easiest way to create a “cable-free” environment. Windows 8.1 inside! - With the anticipation and excitement to have Windows-Based Mini PC, LIVA X is proud to bring you the latest Windows 8.1 with BING OS (optional) to ensure you a pleasant user experience. Compared to the previous version Liva, Liva X has been fix all the weakness of the first released model.